93 Roman Imperial. A collection of Roman Imperial bronzes. 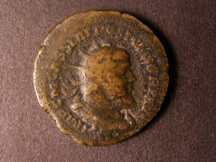 Mixture of sestertius, As and dupondius. Various grades and conditions and including a sestertius of Clodius Albinus and some scarcer reverse types. Poor to VF. 1320 Roman.(2). Nero sestertius, reverse Roma seated left. Nero Claudius Drusus sestertius, reverse Claudius seated left. Both coins are in fine condition.